As you may have observed I’m a big fan of flat-twists and up-dos. This is because they ‘tame’ my locks, look stylish and do not require the use of heat and chemicals. 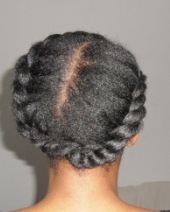 They are also protective styles that can be maintained for up to two weeks. If you think that you can’t flat twist your own hair then I’m here to tell you that you can! It just takes practice and patience. Just start off with learning how to part your hair in straight lines with a rat-tail comb. Neat partings are everything! Then work on your flat twist technique with small sections of your hair. There is no right or wrong way to flat twist; you have to find what feels comfortable for you. I am right-handed so when I flat-twist my left side I twist downwards and on my right side I twist upwards. This works for me. Give it a try and see how it feels. Girl you are an artist with your hair! Absolutely lovely! Thank you for supporting my blog, your likes and comments, have fun posting!!! You’re welcome dear, have fun.